On this debut CD, drummer Dan Pugach shows himself to be a composer and arranger who has mastered the art of making a group sound much bigger than it is. His nonet plays intricate and soulful jazz with the punch of a much bigger band. Pugach is very good at using brawny up-tempo rhythms. The CD's opener, "Brooklyn Blues" kicks off with a New Orleans second line groove that leads into a wall of shouting staccato horns driving through a jaunty arrangement out of the Thad Jones-Bob Brookmeyer school while "Belo's Bellow" works off of a funky rumba beat that provides a stimulating backdrop for Andrew Gould's soulful alto sax and Carmen Staaf's rolling electric piano. He also has a talent for ballad writing manifested in the intricate ensemble lines of "Coming Here" and the relaxed, plush urbanity of "Zelda." The former features haunting solos by Ingrid Jensen and Jeremy Powell while the latter is full of romantic flugelhorn playing by David Smith. The CD's title, Plus One, refers to Pugach's wife, vocalist Nicole Zuraitis, who graces four tracks using various approaches. On Dolly Parton's "Jolene" she conveys a warm, folksy yearning and on Chick Corea's classic "Crystal Silence" she stands out with a precise classical soprano voice. Then she changes to a mood of breezy elegance on Ivan Lins' "Love Dance" and coos sassily like Peggy Lee on Pugach's original, "Our Blues," as the band slides into a hip blues groove worthy of Count Basie complete with wah-wah trombone, stuttering piano and shouting tenor. 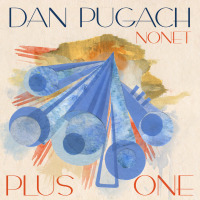 The nonet is full of fine players who acquit themselves well but Pugach's drumming holds everything together. He's never really out front or overbearing but you can hear him keeping the rhythm firmly in place and, with bassist Tamir Shmerling, constantly working to move the band along. You really notice how well they mesh when they back Smith's trumpet solo on "Discourse This." Pugach stays within mainstream big band parameters but his charts have energy and freshness. This is a very good first statement from someone who will, hopefully, create a lot more exciting jazz in the future. Personnel: Ingrid Jensen (2,3,5,8), David Smith (1,4,6,7,9): trumpet; Mike Fahle: trombone; Jen Hinkle: bass trombone; Andrew Gould: alto saxophone, flute; Jeremy Powell: tenor saxophone, clarinet; Andrew Gutauskas: baritone saxophone, bass clarinet; Nicole Zuraitis (3,6,7,8): voice; Carmen Staaf (2,3,5,8), Jorn Swart (1,4,6,7,9): piano; Tamir Shmerling: bass; Bernardo Agular (5): pandeiro; Dan Pugach: drums.